Factory Pattern - Creational Pattern - Remove lots of scattered new keywords by introducing a factory class, and stop exposing our concrete classes by introducing a base interface type. Abstract Factory Pattern - Creational Pattern – It is an extension of factory pattern, in case we have lots of similar kind of factory pattern classes in to one interface. Builder Pattern - Creational Pattern - Helps if construction process of an object (Invoice) is complex and do I need to separate construction from its representation. It has 3 component. Builder - Defines the construction of individual parts. Director - Takes those individual part from builder and define the sequence to build the product. Product - is the final object. Ex. construction of Tea object like Tea without sugar and tea without milk. Prototype Pattern - Creational Pattern - Helps us to give a way to create a clone object from existing object. There are 2 type of cloning. 1. Shallow cloning - When only parent object is being cloned. 2. Deep cloning - When with parent, its aggregated child objects are also need to be cloned. Adaptor Pattern - Structural Pattern - Helps us in case of 2 class types are incompatible because of its incompatible interface. These are of 2 type. Collection classes have Add() and Stack class have Push(), here both are doing same thing but Add and Push are not compatible. 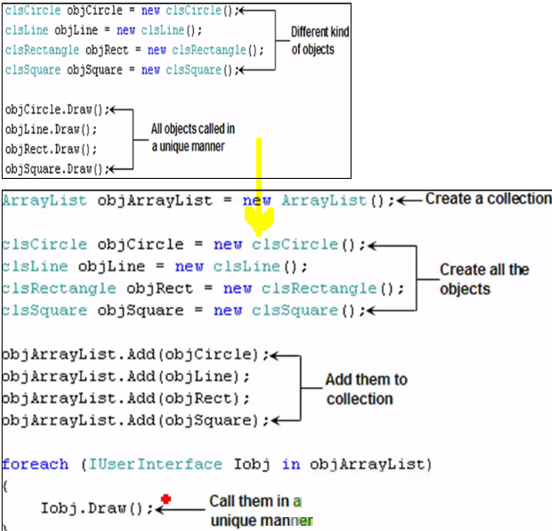 Bridge Pattern - Structural Pattern - Helps to decouple abstraction from its implementation. Composite Pattern - Structural Pattern - Helps to treat different type of objects in uniform manner. Decorator Pattern – Structural Pattern – Are nothing but the inheritance. Proxy Pattern – Structural Pattern – Helps in making available heavy object or sensitive object throughout network by sharing parent interface ref object rather than actual object (Web & WCF Service Client). Template Pattern – Structural Pattern – Helps in generalising something by using abstract class and make specific type by inheriting abstract class. Here abstract class will be like template for all its derived class. Mediator Pattern – Behavioural Pattern – Helps in communicating component (purchase, payment, checkout etc.) in a loosely coupled manner. Move communication logic from component to mediator. Iterator Pattern – Behavioural Pattern – Helps by allowing sequential access of element without exposing the inside code.